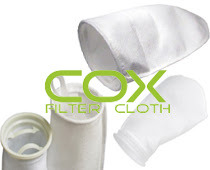 WATER POLYESTER FILTER BAGS, China WATER POLYESTER FILTER BAGS, Quality WATER POLYESTER FILTER BAGS manufacture by COX Filter Cloth. Micron filter bag is pure high-quality melt-blown microfiber cloth after finely hot melt or car every made. The water filter bags filter accuracy is usually nominal filter accuracy. PE Filter bag has excellent chemical properties, stability and heat resistance is applied to the highest performance in the media industry on behalf of all commonly used filter material performance the most high-end variety, have reached a higher filtration efficiency and filter precision. level. Commonly used filter such as PE, PP, PTFE, NMO. CharactersThe filter bag is a key part in the baghouse during operation, usually cylindrical bag vertically hanging in the dust collector. The fabric and design of the bag should be the pursuit of high-efficiency filter, easy-to-dust stripping and durable effect. Pulse and air box pulse dust collector, dust is attached to the outer surface of the bag. Dusty gas after dust collector, dust is captured in the outer surface of the filter bag and clean gas enters into the bag through the filter internally. ag inside cage to support the filter bag to prevent bag collapse, while it helps to clear and re-distribution of the dust cake. Collar ring:stainless steel ring, plastic ring. Absolute precision seamless bagIt is formed by pure polypropylene capillary fiber thermal meltblown. The outer layer is thicker deep filter material, to provide layered filter; within the set of large-diameter filter to further enhance the overall deep filter effects, and improve the capacity of the impurities ability. The life of an average of more than five times that of ordinary polypropylene bag. The maximum filtering accuracy 3um. Collar ring, plastic ring.